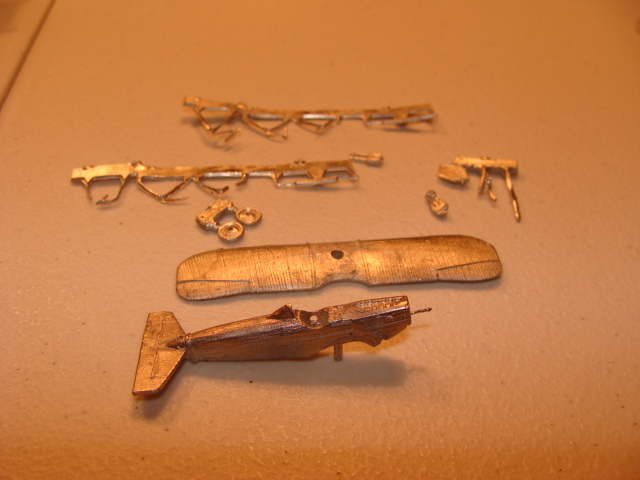 Building the Vallom Sopwith Pup. Read the instructions and identify the parts carefully. 2. I glued the pilots seat to the floor. Tweezers are essential for this. 3. Seating and dashboard being tested for fit in half the fuselage, before gluing into place . 4. After the seat has set, glue the two halves of the fuselage together. Small clamps are advisable. 5. Whilst that is setting I decided to remove the prop shaft and replace it with a brass pin. Here you see the drilled out prop and engine cowl. Glue on the bottom wing checking for squareness. Glue the cabine struts to the top wing. Drill out the wings for struts. Place the supplied jigs on the wings along with two temporary struts to align the setup. Glue the cabine struts to the fuselage. Strut the wings and glue into place. Fill and sand any blemishes left by the struts. Building the Red Eagle Staaken. Red Eagle have included a comprehensive construction list with this model. However I decided to add my own method of building this behemoth as the addition of cammo decals requires a slightly different approach to the build. Open up the holes for parts with a number 62 drill. Attach lower wing to fuselage. Attach lower tail plane to tail. Spray body of plane with undercoat. Lightly wash body of plane in light blue watered down paint. Then finish paint body of plane and details. Cut out the Cammo decals. Make a copy of the wing jigs. Two glued together make a much firmer jig. Cut out the wing jigs. Glue on the lower wing. Ensure accuracy and angle to the body is 90 degrees. Drill hole for the flight peg. Fit wing jigs and top wing to the lower wing. Although I enjoyed the Wings of Glory's version, it lacked the unit crest on the sides of the crate. Building the Skytrex Ansaldo AI. Clean up and fettle the parts. Drill the hole for the Flight peg. Using paper clips, rather than the soft lead struts provided, bend into shape the under cart support struts and the cabine struts. Drill out all the holes for the struts and try them for fit. Fit and glue the cabine struts, using the top wing as a template to ensure they are vertical. Apart from the lack of a propeller this is another straight forward build suitable for a beginner. Drill through the prop boss to fit prop (Not supplied with this kit). Make prop in two halves from plasticard. Clear out holes for cabine struts, and wing struts. Although I am now getting used to the fine lines of the SRAM range, I’m afraid that I still have an engineer’s mentality at heart. Consequently, I beefed this one up just like my Pom with new wings and steel paperclip struts. Mark out the wings with the official ones for templates, and cut out with a craft knife. Shape and finish the wings with a needle file and fine wet and dry paper. Position the engine and glue in place. Glue in the pilot’s seat. Drill out the prop boss and glue in a pin for the prop shaft. Assemble the floats by drilling holes for the cross struts and glue into place. Fettle up the castings, and then make paper templates for the cammo decals. Use these to cut the decals from the printed sheets. Drill any holes that are not opened up. Unlike most of my builds I now undercoated the components before assembly to facilitate the addition of the cammo decals. This one needed very little cleaning up but did have a fault with the shape of the bottom wing which I remedied by producing a new one in plasticard from a scale drawing. Clean up cast lines on metal parts. Clear out all holes with a No 62 drill or similar. Position struts and glue in using top wing as a jig. This is another easy one, for the beginner. Open up all holes until the struts will slip in easily. Fit the struts in pairs, and glue to lower wing. Use the upper wing placed on top to align them. In deference to several requests about building an easy aircraft for beginners, I give you the BE2c. It will also fill a niche in the upcoming series 5 release. This is yet another offering from Skytrex. 1. Fettle the casting and if required make an extension to the rudder. Here is the sequence in which I built My Skytrex Handley Page Bomber. 1. Clean up parts. Use a fine Swiss or needle file for the plastic. 2. Wash plastic parts in detergent. 3. Allow to air dry. 4. Drill the location holes in body and wings. I used a No 62 drill. 6, Glue bottom wing ensuring distance on both sides are =. This is again a fairly simple aircraft build with only one diversion from my usual method. Glue the cabine struts to the upper wing. Position the main struts temporally and use to position the upper wing. This is an easy one for a beginner to have a go at. Glue the four outer wing struts to the lower wing. Use the upper wing as a template to align them. When dry assemble the cabine struts in the same manner. Once these are dry, place the top wing on and glue. This would be a good build for a novice. Clean out the strut holes with a suitable drill. This time I used wire pins for cabine struts to strengthen the wings. Pop in the pins for cabine struts. Drill all holes to clear out burrs including the prop boss. Temporarily affix the under wing. Spray all parts white with primer. Over paint all parts which will have decals with a thin white wash of acrylic paint.Several coats may be needed to cover fully. Cut out decals to the outline. Paint all the coloured parts of the plane. Re building the SRAM Pomilio PE. I decided that as it stood this aircraft was just too fragile to use in games. I therefore replaced the wings and tail section in Plasticard, the undercart with a spare Reviresco one, and the prop was kindly supplied by Angela at Skytrex. Pilot is also Reviresco and gunner Peter Pig. Thus we have a fully Allied combination of parts. Clean off the resin flash. Draw up the new wings using the old ones as a template. File the wings to shape. Drill the wings as a pair for the strut holes. Here is How to of my resin kit SM-1. This is a tricky little build due to having to bend the engine and cabine struts to size before assembly of the wings. Clean up the flash on the casting. Glue to engine with crank handle forward, and the sloped cabine struts also pointing forward. Test fit the engine mounts to both wings and glue to engine but not the wings yet. This is the next of the Giants that I have tackled thus far. Because of some differences in detail I adopted a slightly different build plan from the Handley Page. 1. Clean up the casting. 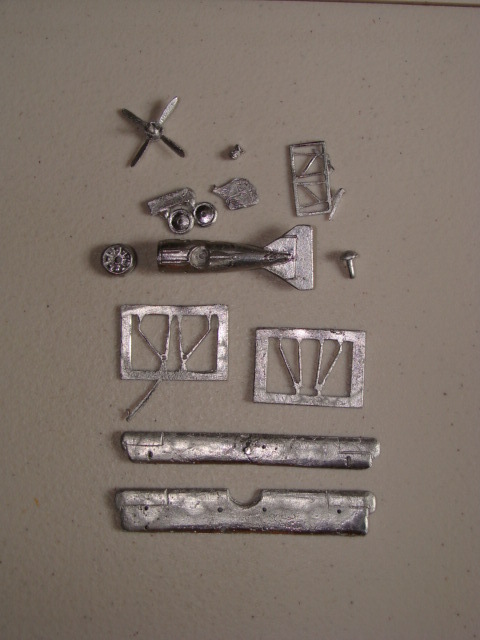 The Kit from Reverisco is part cardstock and part metal to economise on weight. I decided to construct the card fuselage and then use it as a pattern to make it in nylon with plasticard wings. When it arrived it came with scale elevations in colour, so my construction was made much easier than I envisaged it would be. So here is my construction method. Don’t try this at home folks. Cut out the card body and wings to use as templates. Assemble the rear card fuselage. Mark out the wings onto plasticard. This was an easy build. It could be attempted by almost anyone with simple modelling skills. Clean off the flash and casting lines. Degrease the plastic parts with washing up liquid. Drill all holes out to enable easier fitting of parts. Fit two 12mm struts to centre holes in lower wing. Fit the engines in holes on either side high above the wing and with the spindles forward. Check fit to upper wing. Fit the 15.5 mm struts to the wing. Clean off flash and wash resin parts in washing up liquid to remove any traces of release agent. Glue lower wing in place and ensure that it is aligned correctly. Drill out all holes for struts, tail plane, floats etc. Glue in cabine struts and align the top wing. To help in this place two temporary struts in the extreme end wing holes. I was not very happy with the quality of the wing on this plane, so decided to scratch build both the lower wing and the new upper one. Fill flaws with Green Stuff. Sand it smooth with wet and dry paper. Cut out new wing from plastic. Use old wing as rough guide but remember to reduce profile as Biplane has shorter and narrower wings. This is the most tricky build that I have undertaken, mainly because the old style lead components were not up to the strength needed for Wargaming. I, therefore, decided to reconstruct the wings and their method of attachment to the body out of Plasticard and steel wire. Join the fuselage halves together. Green stuff the joints to hide them. Clean up with wet and dry paper. This was a fairly straight forward build as long as you assemble the wings to conform to the angle of the struts. Remove all flash with a craft knife or needle file. Glue up the sides of the fuselage. Glue on the rotary engine. Check bottom wing for alignment and glue to fuselage. Follow the same procedure for the tail plane. Building the Skytrex Bristol F2B Fighter. Building the Skytrex Bristol F2B. This was quite a straight forward build if you obey the enclosed instructions about the positioning of the top wing. Fit the lower wing. Watch the alignment to the body. The stub struts may need tweaking. I replaced the exhaust as I was making the Night Fighter version. 2. Make template for cammo shape to fit fuselage. 3. Cut out the Cammo from the decal sheet using the template. 4. Glue bottom wing in place. Check alignment. 5. Drill out the strut holes. 6. Test fit the outer struts. 7. Temporally fit the top wing to test for fit. Drill clearance holes for the struts and a hole for the peg. Undercoat the parts in silver/ white. Dry fit the parts and bend the rear struts straight. Paint all the parts prior to assembly. Make the Cone de penetration and glue to prop boss. Drill hole in nose to accommodate the prop. This is a straight forward build unless you choose to fully decal as I did. Clean off the flash from all parts. Draw around the outline of wings and fuselage to make decal templates. I used a hole punch to make the wheel covers. Cut out and dry fit decals. For this one I used Reviresco decals. Drill out clearance holes for cabine struts, wings and undercart. Produce flight peg on lathe. Test for fit with genuine peg. Building the Skytrex Halberstadt CLII. This was a simple build excepting that no propeller is supplied with this kit so I made my own. 1. As usual clean off the flash. This particular kit was quite a clean one. 2. Clear out the fixing holes with an appropriate drill and test fit the struts etc. I also drilled out for the flight peg at this stage so that I could mount the plane on my painting stand. Building the Skytrex Siemens –Martin Schuckert DIV. This should have been a really easy build, but the cabine strut holes were miss aligned, so it was a bit of a fiddle to get them re drilled. Otherwise a dream build. As usual remove the flash with a sharp blade/ needle file. Print and cut decals for the wings. Open up the holes for all parts with a small drill. Building the Skytrex Fokker EIII Eindecker. With no top wing to worry about this was one of the easiest assemblies I have had. Consequently I felt the need to make it harder for myself by attempting to rig the plane. 1. As usual I started by cleaning off what revealed itself to be minimal flash. This one, although a monoplane, was a bit of a fiddle for reasons that I will include in the build notes. 1. As usual start by removing the flash. This was almost flash free. 2. I next printed off and cut out my cammo decals. 3. All holes were extended and an extra set drilled out for tail struts which were not supplied in the original kit. 2. Open up all holes until the struts will slip in easily. Here are the details of how I assembled my Skytrex FE. 2B. 1. 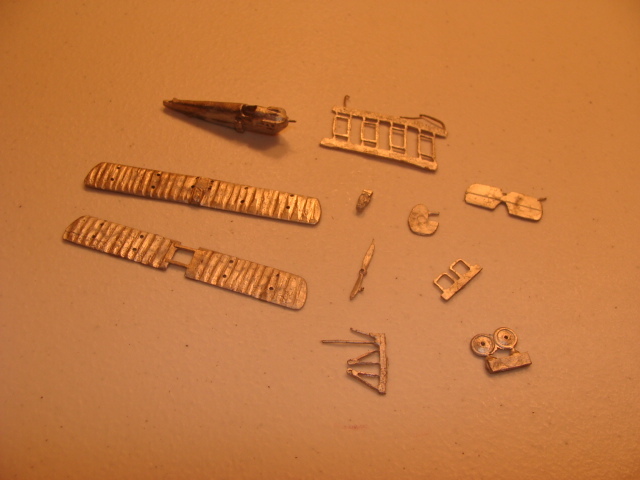 Cut out parts from sprue and fettle. 2. Drill holes for struts in undercart and prop shaft. When I checked the forum I could not find this How To. so thought I would re submit in case anyone had missed it. 1. Clean off the flash. 1. Clean up the castings. 2. Drill through the prop boss to fit prop (Not supplied with this kit).